On the surface, “Grace and Frankie” is the simplest of ideas, with an easy-to-explain premise: Women in the sunset of their lives find out that their husbands are leaving them for each other. It stars a quartet of legendary actors who seem to be having the time of their lives. And it’s created by two TV veterans. Yet in its first season, the series, from Marta Kauffman and Howard J. Morris, was a somewhat puzzling affair, the sort of show where Craig T. Nelson wasn’t just a love interest, but also confessed at a certain point to being an actual cannibal. That’s partly due to the fact that the show straddled so many lines: A comedy with real pathos, shot like a single-camera sitcom but written with a multi-camera reliance on joke patter. But there was a lot about it to respect, including the choice to not end at an obvious point — the wedding of Sol and Robert. Instead, “Grace and Frankie” ended its first season on a dramatic cliffhanger that set up only one of the major threads running through Season 2. As a result, the Jane Fonda/Lily Tomlin comedy enters its second season, which launched today on Netflix, a much more confident affair. The writers seem to know what kind of show they’re writing, the actors all seem more natural and engaged and there’s a core theme to the action that brings the series into territory not many shows would ever be able to tackle, especially in this way. “Grace and Frankie” Season 2 isn’t just rooted in the realities of life for the over-60 set, but crafted in a way that would be impossible without real life experience, real awareness of what it’s like to spend decades on this earth. Because the ongoing theme turns out to be a discussion of what it means to come to terms — with the life you’re living, with the people who are in your life and with the fact that one day life will end. Mortality is a very real and present thing in the show, especially in the final episodes, which make a bold call on a relatively controversial issue. But there’s not as much fear of death as you might expect; instead, the message is that there is literally no time to waste in not living. It was always an essential part of the set-up for the show — the idea that after decades in hiding, Sol and Robert felt they had no choice but to blow up their marriages, so that they could finally be truly together. But the fact that that choice also kickstarted the lives of Frankie and Grace, even as it broke their hearts, was a big factor in driving the show much closer to the line between comedy and drama. 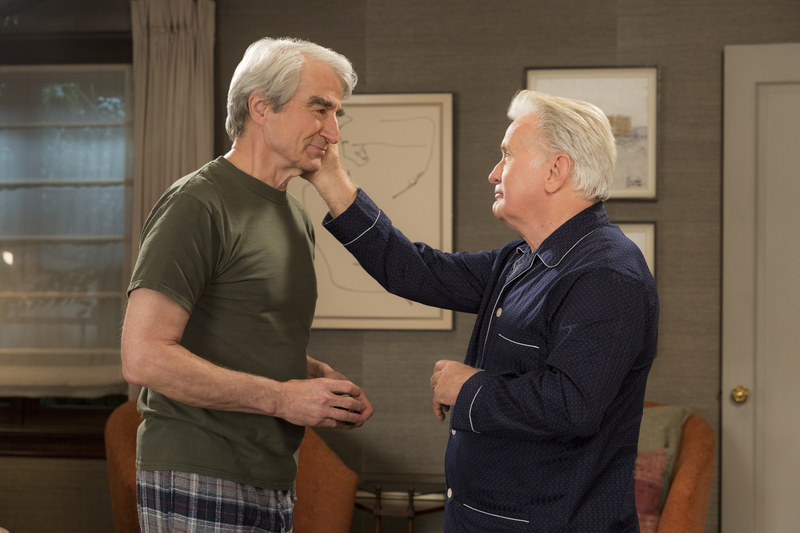 “Grace and Frankie” didn’t, and still doesn’t, shy away from the fact that just because you make the right choice for yourself, doesn’t mean the way it affects other people (like say, the show’s incredible guest cast, including Sam Elliott and Ernie Hudson) doesn’t matter. In retrospect, a lot of the show’s initial charm had more to do with the wow factor of watching Martin Sheen and Sam Waterston play lovers, and watching Jane Fonda and Lily Tomlin team up to survive the destruction caused by them. But it took a little time for actual character traits to surface, for both the leading characters and supporting players like the younger generation of Bergsteins and Hansons. This year, both Frankie and Grace undergo real awakenings, each of them challenged beyond their comfort zones. It’s the sort of character growth not usually found in roles for women and men of this age (in fact, in a recent interview Fonda said that playing Grace reminded her of the films she used to do when she was much younger), but tempered by the wisdom and experience that comes with having reached that period of their lives. “Grace and Frankie” has its flaws, but it remains unlike anything else on television. It knows there are limits and ends to everything, and it’s making the most of the time it has.